A lot has been said about Mobile World Congress Americas. A lot, but not enough. The MWCA experience is unforgettable for anyone who has anything to do with web and mobile app development. To be held between September 12 and 14 at the Los Angeles Convention Center, MWC Americas is one IT event inching away from mobile devices and getting centered around other mobility solutions. As goes its tagline, the event will bring the brightest minds in the industry together, only to imagine what the future could bring. Mobility solutions have become the definition of digital transformation for businesses. In this day and age, users spend approximately 5 hours a day on their mobile device. This calls for some serious innovation in the mobility arena. And, that’s what MWCA is known for. Enthusiasts from all over the world gather and discuss groundbreaking, glass-shattering solutions to help inch the world towards mobile-centricity. We doubt you wouldn’t know, but when has a refresh hurt someone? Our favorite mobility event, the MWC Americas is throbbed by 25,000 attendees from over 110 countries with about 1,000 exhibitors and 200+ conference speakers. In all, the MWCA experience is one of the best you can have as a mobile app enthusiast. Web and Mobile app development at MWCA come to a whole other level- with discussions on the future of technology and how it is driving the forces of today. If you are a business in search of a tech venture, it may help you to look for the best Technology Partners at MWC Americas. IT companies and developers from around the world register themselves for this conference. There would be no reasons for you to not get the perfect partner for IT Consultancy at MWC Americas 2018. The event is frequented by IT consultancy providers from across the globe and you are sure to find the right match, learn about the latest on-goings, and network with companies and developers shaping ideas for businesses such as yours. It is a cakewalk when you are looking for an organization in Software Development at MWC Americas. Since the event gets visitors and exhibitors from all corners of the world, these are the best companies exhibiting their talent at the event. There is no reason for you to think if a company is good enough. With MWCA, you find the perfect solutions to your business challenges and the best enterprises to build them for you. Networking – If you are planning on startup solutions or any other mobility solutions using wearable, IoT/M2M, Augmented Reality, or any other technology, you would want to network with companies already solving business challenges in these domains. 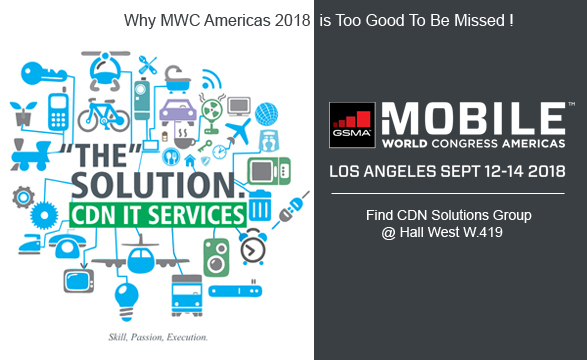 A plethora of mobile enterprise solutions and services can be found in general, but to get in touch with the best, MWCA is the right place to be. The event attracts the best IT outsourcing companies from India and other parts of the world. Pick an outsourcing partner from the best and network with the right businesses to kick-start your mobility solutions’ development. Gain Insights – The MWCA experience is rich from the perspective of a learner. Attendees get to listen to the top industry influencers and gain first-hand insights about the happenings around the globe. With conferences on the 5G technology, Network Optimization, Blockchain, the IoT, Mobile security, Wireless policies, etc., attendees can be sure of gaining tonnes of valuable insights and working knowledge of the industry. This is the key motivating factor for developers and mobility enthusiasts to attend the event. Explore Technologies – If you are someone driven by technology and maintain curiosity in learning about the latest tech drivers of the mobility landscape, the MWC Americas is crucial for you. The best tech minds of the world get together and discuss Web and Mobile app development at MWCA- keeping the foundations to cutting-edge technologies and how they are shaping the businesses and services for tomorrow. For someone deeply interested in getting a practical view of the applications of leading technologies in business use cases, the MWCA 2018 is a must-visit. Collaborate – If you are a startup looking for a technology partner to collaborate with and get your business off the ground, the MWCA 2018 may be a good start for you. It is not hard to find the right Technology Partners at MWC Americas. With IT outsourcing companies and enterprises bringing their best solutions for the exhibit, it must become really overwhelming for you to decide whom to collaborate with. Something’s for sure- you will end up finding the right IT Consultancy at MWC Americas 2018. Don’t Know Where to Start? Find CDN Solutions Group at MWC Americas 2018. CDN Solutions Group is a leading software development company with its root in India and branches in North Carolina, US. We have helped businesses in key industries with solutions backed up by cutting-edge technologies. IT Consultancy – We analyze your business requirements and address your queries. We don’t push the start button unless we have helped you understand and comprehend our vision for your business’ tech requirements. Technology Partnerships – We want to join hands with businesses who know technology can solve their most pressing challenges. We want you to offload IT to us, so you can focus on what you do best. Software Development – We have catered to numerous businesses in various sectors and built mobile solutions for them to improve their workplace productivity, increase customer engagement, and so on. We are ready to do the same for you. Hire Onsite Resource – We want to help you in any way we can- with the tech support we have. Mobility Solutions – We offer to help you with the best App development solution for your enterprise- customer-facing or not. Startup Solutions – We have what it takes for startups to get off the ground. We can turn that next-big-idea into a working mobile app. Schedule a meeting with us right away. We are sure we can help put the IT pieces together in your business puzzle. Join in the buzz of the MWC Americas 2018. We expect you there! What your Users Really Expect From your Mobile App?